The Power of Social Networks seems to be taking notall places! From name to event staff, everything about notall is voted, created and funded by fans, and anyone would be very wrong to underestimate them, as the group is entering its 5th anniversary. You may have seen them on the stage of Japan Expo Paris in 2017! notall was the winner of the Tokyo Candoll contest two years ago and was able to share their energy in France in a series of crazy performances during Europe’s biggest Japanese culture festival. The grand finale to notall’s nationwide tour 「VILLAGE VANGUARD presents notall Zenkoku Tour Ima Ichiban Asoberu Idol ～CD uranakutemo gomennatsuai〜」 (The Most Playful Idols ～Sorry that we stopped selling CDs〜) was held at Shinagawa Intercity Hall on March 21st. It was not the only special occasion to hold a celebration for. Watanabe Chiko had announced her upcoming graduation a few weeks prior, and this big finale was the perfect moment for fans and members to send her off in a bang. The four members of notall show up on stage wearing their green costumes, covered in their signature QR codes. The show opens on the epic “Sono Saki He”, then fan favorite “Kimi ni DA-DA-DAN”, and finally the joyful “Maji”, as the fans already jump around barely a few minutes into the show. notall’s energy skyrockets the concert into a whirlwind of crazy fun right from the very beginning, the idols simultaneously playing around with their fans from the stage and hugging each other in this final 4-members performance. The next segment has a peculiar layout as the group alternates songs and videos. Stores chain Village Vanguard collaborated with notall to create four rather interesting items: Katase Narumi‘s “Most Idol-Flavored Chocolate”, Sato Haruka‘s “Unlickable Candy”, Watanabe Chiko‘s “Gummy That Tastes the Best with Rice (barbecue meat-flavored)”, and Tasaki Reina‘s “Most Hilarious Rusk(sksksksksk…)”. Each one of these products was released along with a music card to download a new song, throughout the entire nationwide tour. The videos presented on the big screen introduce not only these items, but also the songs associated with each one of them. The segment ended on Tasaki Reina’s item’s song “Hotarubi”, during which the venue’s lights were totally turned off, and the members were only guided by the fans’ smartphone flashlights – recreating an ocean of summery fireflies in the audience. …they did not wait for much longer, as notall comes back on stage wearing brand new navy blue and white costumes, for a special collaboration performance! Three notall songs were mashed into one big medley, emphasizing on the members’ dancing, complimented by DiBLack‘s supporting performance. The concert comes back on its usual track with some of notall’s catchiest songs, such as the crazy “Oniku de Night☆Sensation”, the fresh happy vibes of “#Hashtag wa tsukerarenai” or the sharp guitar riff of “Usagi Tsunderella”. The latter saw the crowd move around to create a gigantic head-banging circle for each of its choruses, taking up the entire standing audience space, then breaking out to rise their fists up in the air while singing along with their idols, in a very impressive and emotional moment. notall almost did not take a break, as they just stopped for a few minutes to thank the audience and finish the main part of the show. The segment ends on “Thanks a million ~Arigatou~”, as a direct message from the idols to their fans and their contribution to their careers. 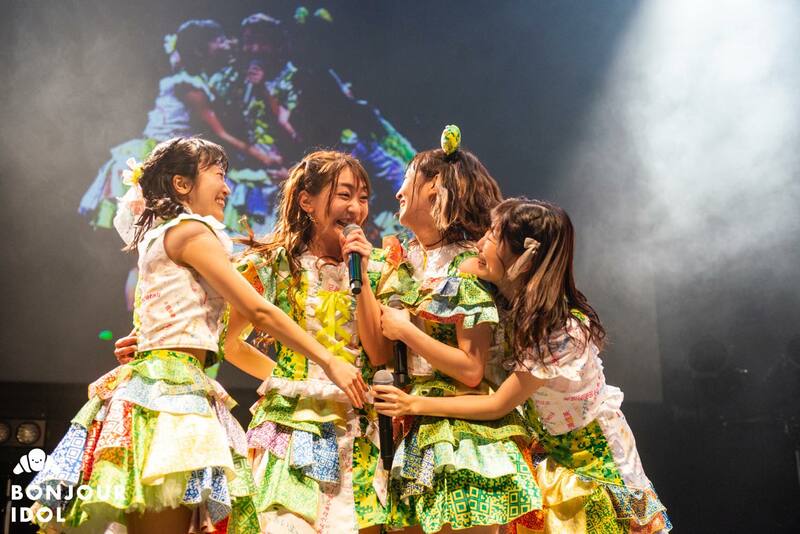 The fans did not wait for very long to start calling their idols back on stage, and the final part of the day opened on a video tracing back to the very beginnings of notall, focusing on Watanabe Chiko‘s comments and statements over the years. The first song of this Encore call, “Don’t Give Up!”, echoed Bechiko’s dreams of dancing and singing on stage, that were fulfilled thanks to her career as a member of notall. The fans broke hundreds of glowsticks, dyeing the venue in a soft yet vibrant orange light for Bechiko. The members’ speeches to their groupmate and friend took a rather long time, as all of them got caught up in their own emotions. A lot of tears are shed, despite Watanabe Chiko’s happy teary smile, that did not leave her face throughout this entire part. “Honestly, if we had only been classmates, we would never have talked to each other. If it was not for notall, we would never have been such good friends, and I’m very grateful for this,” says Katase Narumi, holding Bechiko’s hand. Tasaki Reina, the group’s biggest airhead and youngest member, spent most of her time sobbing and repeating “Chiko-chan, please don’t go”, causing hilarity in the audience and on stage, as her groupmates were also laughing at how weird her speech turned out, in a true Tasakyon fashion. Leader Sato Haruka seemed to be doing the best at holding back the tears, but started crying as soon as her time arrived. “We have seen many big groups disbanding or graduating this year, and I was wondering if notall would be okay. I honestly understand the feeling of wanting to quit,” she says, “but notall’s songs are about sharing our feelings with the fans, whether it is frustration or happiness. I want to keep going strong, so Chiko-chan won’t be able to worry about notall and be proud of us.” She ended her speech by leaping into Bechiko’s arms to cling onto her like a big baby, all smiles and tears. Bechiko ended the speeches with her final words to her fans. “I am truly happy I was able to meet everyone. This experience as a member of notall is my treasure and I will happily carry it with me as I will start my new life. Today is not the end. It is a new beginning for notall. (…) Please support me, but also support these members that I love as we are taking our first steps into this new chapter,” she said, before bowing down in front of a thunderstorm of applause. The show, as well as notall’s original line-up, ended up in the same energetic whirl of joy, the fans spinning their towels up in the air to the catchy harmonies of “Kirameke☆tweet girl!!”. As the members hugged each other tight, Katase Narumi, Tasaki Reina and Sato Haruka disappeared, leaving Watanabe Chiko by herself. The first notall graduate took her time to wave at every one of her fans before going down the stairs at the center of the stage, the audience giving her an invisible push on the back into her brand new life. notall is currently holding auditions to add new members to their line-up for this new adventure. 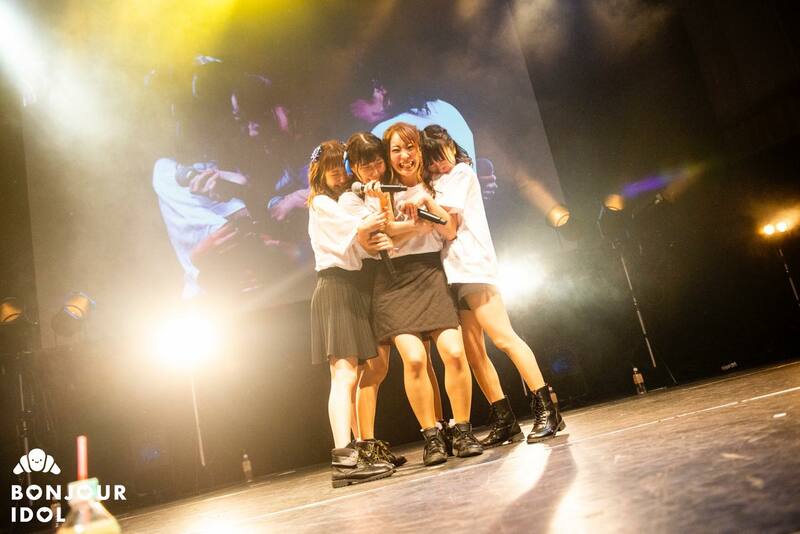 They will be holding a one-man live on April 20th at Shibuya WOMB to reveal their second generation, who will, we are sure, share the same beliefs as their comrades. The story of notall is not only a tale of teamwork and gratitude, but also all about friendship and support.